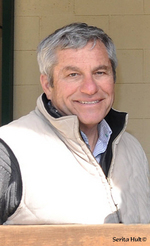 Roy S. Lerman has been involved in the Thoroughbred business as an owner, breeder and trainer for 35 years. He owned and operated Lambholm Farm in Middleburg, VA for over 20 years before purchasing the late Allen Paulson’s Ocala-based Brookside Farms South in Florida in the spring of 2000 and renamed the operation Lambholm South. In early 2005, he purchased Jack Dreyfus’s historic 1,800-acre Hobeau Farm to expand Lambholm South’s holdings. Roy and the Lambholm South staff are dedicated to providing its clients with the best and most comprehensive services available at Thoroughbred operation. Roy currently serves on the FTBOA's Board of Directors. He and his wife Shirley, have one son Ethan, an attorney in Saratoga Springs, NY and Missoula, MT. Peter Brette comes to Lambholm after serving as principal assistant to Michael Matz for more than 15 years. Peter was instrumental in the success of the great Barbaro and other top racehorses, such as Union Rags, Visionaire, and Round Pond. His long and accomplished career began at 16 as a jockey in England. He went on to Dubai, where he became the assistant trainer and stable jockey for Bill Mather, the private trainer for Sheikh Ahmed bin Rashid al Maktoum, eventually becoming Champion Jockey. Peter and his wife Kim have one son. Rich Meyers began his Thoroughbred career under the tutelage of Elmer Huebeck, Jr. in 1980 at Hobeau Farm. He went on from there to become Yearling and eventual Farm Manager of the very successful Lin-Drake Farm. After 25 years of farm management in Florida and California, Rich has returned to the same farm where he began. As General Manager of Lambholm South he oversees the Weanling, Yearling, and Broodmare Divisions, as well as the Maintenance Department. Rich and his wife Marta have one son and two daughters. Junior Serna is a lifelong horseman who was a successful racetrack trainer prior to moving to Ocala in 1977 and going to work for Murty Farm, which would eventually become the current Lambholm South. Junior was the farm’s trainer throughout the years as it changed hands to become Wooden Horse Stud, Brookside Farms South to Lambholm South. Under his direction the farm’s training program produced such national champions as Slew o’Gold, Epitome, Personal Ensign, Flawlessly, Ajina, Escena, Farda Amiga, Azeri, Saint Liam, and Speightstown. Junior and his wife Marie have two sons and one daughter. 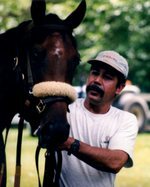 Alberto Torres’s career in the horse industry began over 25 years ago when he began working for his uncle, veteran horse trainer Mike Hernandez as an exercise rider. He has been with Lambholm in various capacities since 1991 and is currently an Assistant Trainer. Alberto and his wife Laura have two sons. Cristina has been with Lambholm South in the broodmare division since 2010. Her father, Catarino, was an accomplished horseman and Cristina has followed in his footsteps. In 2012 Cristina was given the opportunity to go to Kildare, Ireland and complete an externship at the prestigious Irish National Stud. 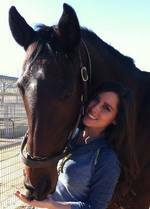 She's extremely knowledgeable and devoted to the horses in her care, and in 2017 Cristina was promoted to Broodmare Manager. 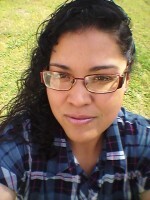 Angela Palacios graduated from the University of Florida with a Bachelor's Degree in Animal Science, specializing in Equine Industry, and minoring in Agribusiness Management and Sales. Before coming to Lambholm South in 2007 she worked with many top consignors. Her main duties are handling private and public sales, mating selections, and stallion contracts and bookings. Angela and her husband Jacob have one daughter and one son. 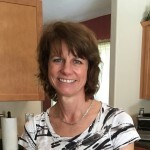 Vicki Peck has been at Lambholm South since 2008. She wears many hats and oversees all of the operations in the Lambholm South office, including Human Resources, Payroll, Accounts Receivables, Accounts Payables, Horse Records, and Ocala Organics Compost. She is also the Executive Assistant to Roy and Shirley Lerman and an integral member of the Lambholm team. Vicki is married to Dale. 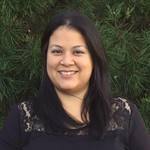 Susan Castanon has been with Lambholm South since 2017. She handles Accounts Receivables, Accounts Payables, and Horse Records. Susan also attends Central Florida College, where she is majoring in Business and Organizational Management with a Specialization in Agribusiness. Susan and her husband Edgar have two daughters. The Thoroughbred horse has been Ren Carother's life-long passion. She was raised on a Thoroughbred farm, which accounts for her keen understanding of pedigree, conformation, and body language. She is still an active owner/breeder, and loves to form handicap the races too. Thankfully, her depth of experience with thoroughbred racing has enabled her to make a career promoting it. Ren is married to longtime TVG anchor/analyst Matt Carothers. It all started in 1997 when Ruth Evans answered an ad in the Fauquier Times for a Thoroughbred horse farm in Middleburg, VA, that was seeking an Administrative Assistant, and the rest is history. Previously a legal secretary, who showed hunters and raised the fastest Jack Russell Terriers in the East, she principally acted as a personal assistant to Roy Lerman and his wife, Shirley. Ruth was also the farm's go to person in a myriad of areas from travel agent to assistant building engineer. If there was something that you needed to know about Lambholm, then Ruth was the person to ask. Ruth became family and after 20 years with Lambholm, she decided to enjoy a much deserved retirement. Recently Ruth was invited to compete in the Purina 2017 Incredible Dog Challenge Eastern Regionals with her dog Tootsie. Just because she has retired, doesn't mean that she has slowed down. Catarino Alferez had been with Lambholm since 1990 and wore many hats. From exercise rider to broodmare manager, he did it all. Catarino was truly a jack of all trades and an invaluable member of the Lambholm South team. He will be sorely missed by all that knew him. Catarino is survived by his wife Maria and their two daughters and one son. Shakira was a New York Bred who joined Lambholm in 2003, and was a beloved member of the Lambholm family. Whether she was at the viewing stand greeting visitors, overseeing training, waiting in line for the taco lady, or riding shotgun in the Gem around the farm, if you've ever visited Lambholm South, you have almost certainly met her. During the summer Shakira would travel to Saratoga Race Course where she was usually seen riding in the Gem with Roy, going back and forth from the barn to the track to watch sets of horses train, or going to grab a cup of coffee on Broadway. She was more human than animal and things will not be the same without her. Shakira was a beautiful being and she will be missed deeply by everyone at Lambholm. Rest in peace sweet girl! Formerly known as Buster in a previous life, Roy Lerman rescued him from a shelter in upstate NY at the ripe age of 10 years old. With his new lease on life, he also received a new name, which he was jokingly given because he was a dog without a home. However, that name became ironic, because everywhere that Snowden went became his domain. Whether it was hanging out at the Lambholm barn in Saratoga, exploring the nearby farm, or relaxing at the lake, he acted like he owned the place. It was most evident when he returned to Lambholm South in the winter. He would make his daily rounds like clockwork around the 1800 acre farm. We never knew exactly what he did or where he went, but he certainly did. If anyone tried to interrupt his daily routine, he would stop for a moment and look at them with a smile, and then go in the opposite direction with his helicopter tail waving goodbye. Snowden will be sorely missed by everyone at Lambholm and the farm won't be the same without him. Rest in peace sweet boy! Designed by eLink Design, Inc. and Hosted by Intelliwire, LLC.